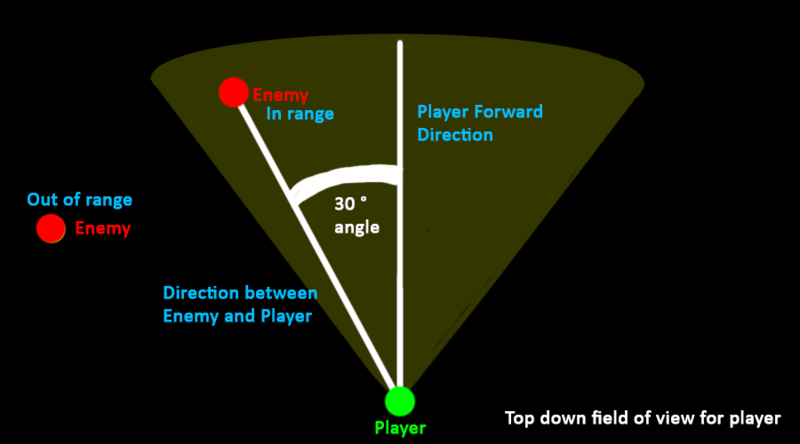 Did you know that you can calculate the field of view of a player and check whether an enemy or player is in range in front of you. Great for enemy visibility or player targeting etc..
Will this work With AI to save on performance with Pathfinding. yes, this can be used for enemy AI or other NPC's in the scene, not just the player. It is also not physics based, so there are many use cases for this snippet. This could be used to chase the player if you wander into their sights or sneak up on them. But once they have sighted you, you need to use waypoint(spline paths) or navmesh(pathfinding) in order to follow the player around a complex environment, otherwise they end up running into a wall. The best way of saying is that it compliments a pathfinding solution(spline paths or navmesh).